The belts tension is crucial for your safety and prolonged belt life! Make sure you keep an eye on the belt. The adjusting bolt is indicated with the red arrow. You turn this one clockwise to tighten the belt, and counterclockwise to loosen. Be sure you double check the torque on the pinch bolts after about 200 miles, they do tend to change after an adjustment. Anyway one tips the mechanic shared on the belt is: the tension is right if you can turn the belt by hand no more than 90 degree on itself. And incidentally this coincide with 0-2 mm distance tips from Dailyrider. 2) Rotate the rear sprocket so the yellow indicating mark (on the sprocket) is to the rear of the bike. 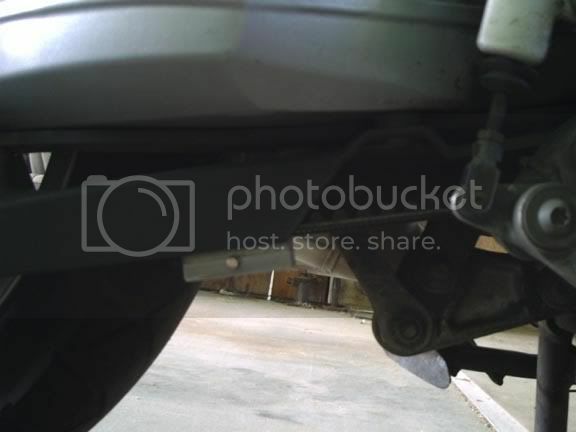 4) Install clamping/measuring tool (BMW 27 0 501) on belt at the corner of the swingarm. Make reference of position related to the belt guard. 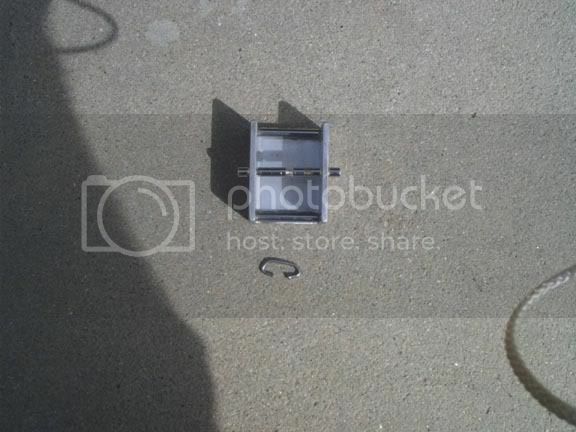 5) Hang tool (BMW 27 0 502) (weight = 15.5 lbs / 7KG / 7000 grams) and note amount of deflection against guard. Also don't roll the bike without your weight on it, as that will screw up the position of the belt on the sprocket. you should now have TWO marks on the paper: the belt without tension and the belt with tension. 6) Adjust belt so the reference edge of the belt guard is at the edge of the red & green line on the clamp/measuring tool. 7) Torque the pinch bolts. Remove tools. Go ride. 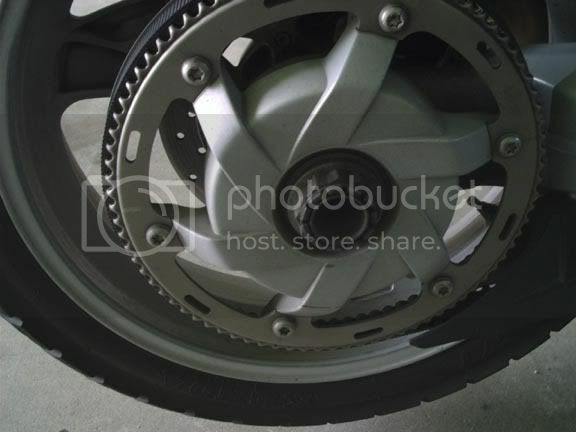 8) Take the bike for a ride, stop and then look at the belt position on the rear sprocket. 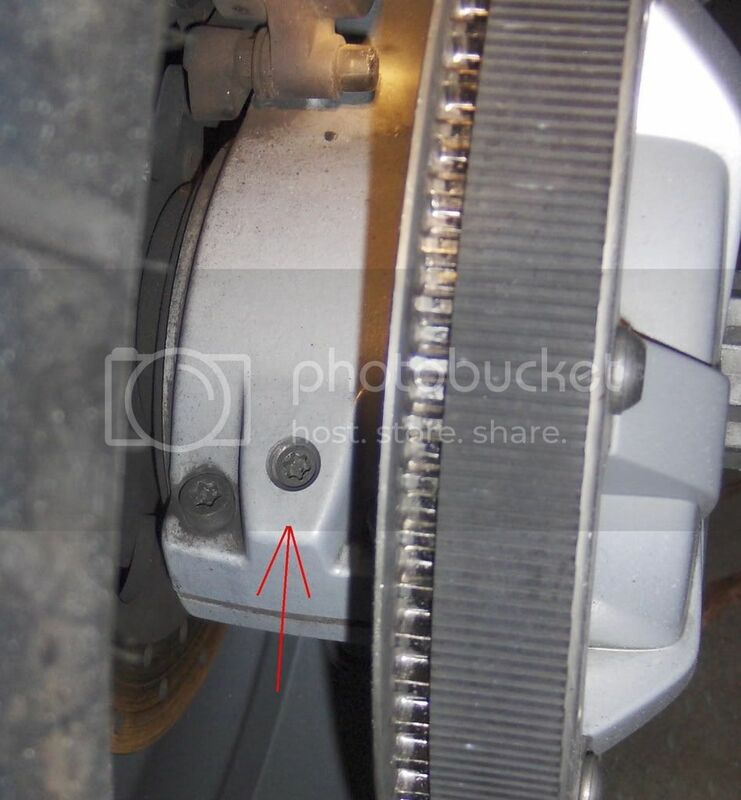 If the belt is more than about 3mm from the inside flange of the sprocket, it probably needs a small adjustment. If you do adjust it without the measuring tool, mark the adjusting screw with some whiteout or nail polish, so you have a reference and never adjust it more than half a turn, tighten everything back up and test it. 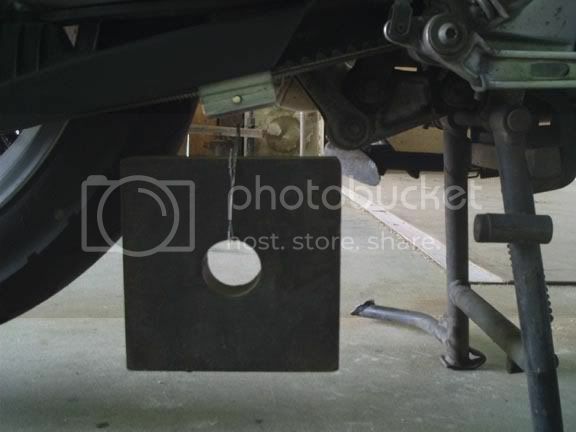 After tightening the pinch bolts to 16 Ft.Lbs., tighten the adjusting screw to 12 Ft.Lbs. The belt takes very, very little adjustment. When the belt rides between 1 & 3mm from the inside flange of the rear sprocket, you're good. OK, here it is. You'll need some specialized tools to make the belt tension tool. A lathe would be nice, a 4" grinder, drill press and various hand tools. Start out with a piece of channel, I used aluminum, because its easier to work with, the channel should be about 40mm in depth and 1 and 1/2" or about 38mm in overall width. The width is critical, because it has to fit between the belt guard at the bottom. The overall length of the channel should be 49mm. Now you have a piece of channel 38mm wide X 49mm long X 40mm deep. With a drill press drill a hole in the center, lengthwise, about 25mm down from the inside of the channel with a 1/4" drill. Make a 6mm pin about 40-42mm long and in a lathe cut two shallow grooves to match the legs of the channel and one in the center for the weight to hang from. If you don't have access to a lathe, you can make do by spinning the pin in a drill and take a 4' grinder with cutoff wheel and hold it against the pin to cut a small groove. The grooves are not real critical, you just want to keep your weight centered on the belt. Make two 5mm pins the length of the inside width of your channel and JB Weld them on the inside top of your channel, flush with the ends, the pins should measure 49mm on the outside and 39mm on the inside. Now make yourself a 15 and 1/2 pound weight with a hook extending from it, lead is the best thing, easy to cast in a tin can and a 1/8" hook about 3 or 4" long. The lead you can buy in bars from a body shop supply store. I didn't say this was gonna be easy, BMW uses a single side affair that clamps to the belt with an eccentric, but with the channel the eccentric is not necessary. Now to use it, put the bike on a suitable stand so the bike is straight up and about 1/2 to 1" off the floor at the rear tire. 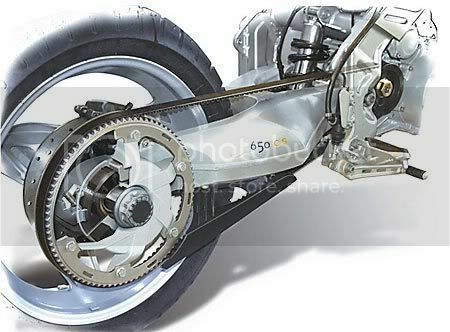 Put the transmission in 1st gear, take your channel and put it over the lower run of the belt, move it back to where the front of it is even with the front end of the belt guard, right under the kink in the swingarm. 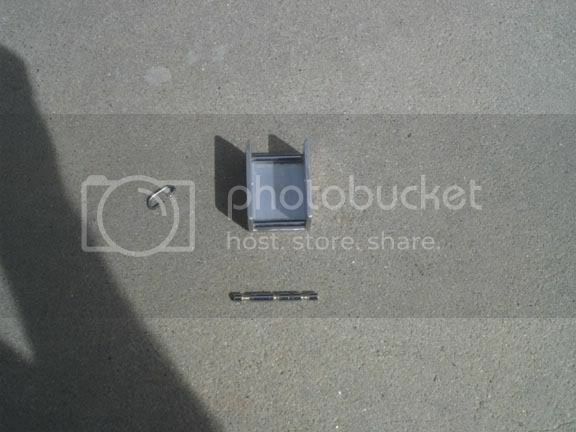 Put your notched 6mm pin through the hole in the channel. Now, put very light pressure down on the channel to hold it against the belt and with a fine, felt tipped pen, put a mark along the underside of the belt guard on the outside of your channel. Hang your weight on the center of the 6mm pin and measure the distance from your mark to the belt guard, should measure 5/16" for a new belt and 5/16 to 7/16" for a used belt. I just make another mark after I hang the weight, then remove everything and measure the distance between the two lines, since everything has to be in bifocal range for me. Get the adjustment procedure and torque settings from the repair manual and just remember, all that stuff is aluminum, so don't be too ham fisted!! The usual disclaimer, use at your own risk! Hope you can understand this.